Malletech's design of the G2.6 "Infinity" Glock began by duplicating both the old steel formula and the dimensions of the best old Glockenspiel bars. But they didn't stop there. Malletech redesigned the case, eliminated all sources of noise and revolutionized the suspension. The essence of the glockenspiel or orchestra bell tone is largely determined by the quality of the steel and dimensions of the bars. The great glocks made in the first half of the 20th century were made from the hardest steel available. Today, the major manufacturers start with a much softer steel that is easier to cut, tune and polish. However, a softer metal can never produce the crystalline tonal brilliance of the old formula steel. Many orchestra bells made today still have the bars attached to the frame with screws. Hardly anything could dampen the vibration of the bars better! Other makers have the steel bar lay across a felt pad or string, similarly stifling the tone. This patented three-point support system allows each glockenspiel bar to ring freely, almost as if it were suspended on air. Just three tiny rubber points touch the underside of the bar, leaving the top surface completely smooth and free of holes, screws or other suspension devices. The bar rails and extra-deep case are made from solid oak with brass latches and two oak carrying handles. The bar rails are completely suspended and do not touch the floor of the case. All the contact points, including the bottom exterior of the case are insulated with neoprene rubber and 100% wool felt, eliminating any case noise and leaving the space under the bars to act as one big reflecting and resonating chamber. Malletech uses a special nickel process that does not flake off like chrome and is more flexible, so the plating does not dampen the tone of your instrument. This process produces a uniform steel-gray, glare-free matte finish. 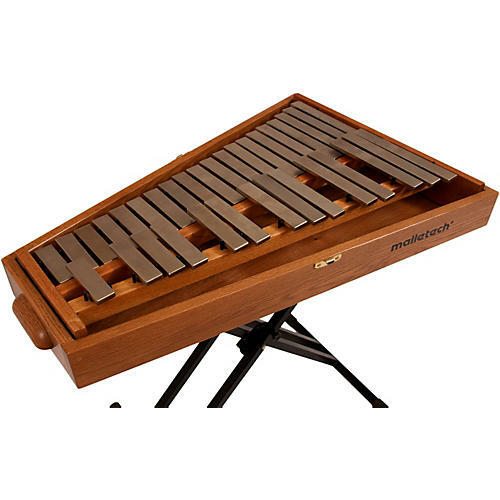 So compare the Malletech glockenspiel with any other set of orchestra bells, of any vintage, made anywhere in the world. The tuning, sustain, brilliance of tone, case, suspension system and overall quality will leave you no doubt about what is the best set of orchestra bells at any price. Weight - approximately 56 lbs.